The new HTML editor widget which was introduced in Oracle APEX 3.0 is a big enhancement compared to the old one in APEX 2.x and it works with all browsers. 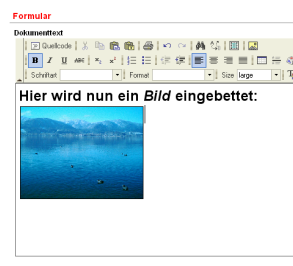 The HTML editor is based on the open source editor FCKeditor. A few features have been removed, because they would require some server side code. One of them is to include images into the entered text. But Carsten Czarski from the German APEX Community comes to our rescue! The German APEX community website has just released a new edition of there How-To articles. This edition has two articles about Integrating the HTML editor FCKEditor and Adding fuzzy logic search to your APEX application.